Spending long periods in a blast freezer is a great way to acclimatise to temperatures below minus 40 degees. 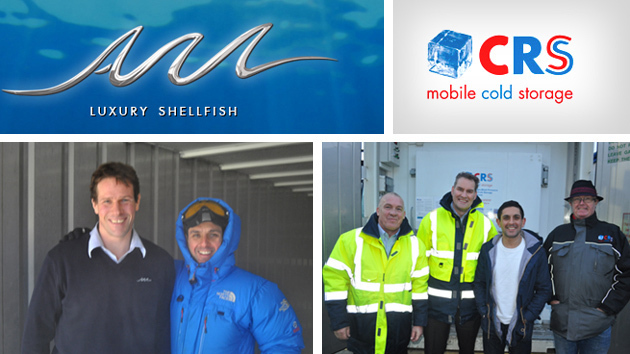 With the kind assistance from industry experts AM Seafoods and CRS Cold Storage I was able to get real experience of the unbelievable freezing temperatures...going down beyond minus 60 degrees. I was also able to put my clothing and gear to the test. I would like to thank Adapt Outdoors in Liverpool for kitting me out with the very best gear...giving me a selection of high performance kit from Rab and Mammut to test in extreme temperatures. Carl Roland is a British explorer and mountaineer. In 2012 he successfully trekked 100 miles on skis to the North Pole, pulling his 100lb sled of supplies across drifting ice for 10 hours a day. His challenges for 2013 include Mount Kilimanjaro and an intensive training regime for his 2014 schedlued climb to the summit of Mount Everest. © Copyright by Click Media. All rights reserved.